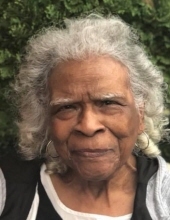 Gray, Sallie Mae, 91, of Louisville died Wednesday March 27, 2019 at her home. She was a retired employee of the National Linen Co. and a Catholic by faith. Survivors include a daughter Danice G. Edmondson; five sons Lee Andrew Gray, Jr.; Derick H. Gray (June); Kevin T. Gray; Dwayne E. Gray and Rev. Bryan W. Gray (Pamela); 16 grandchildren and 17 great grandchildren. Her funeral service will held 12:00 p.m. Wednesday April 3, 2019 at W. P. Porter Mortuary 2611 Virginia Ave., with burial in Lebanon National Cemetery Lebanon, KY. Visitation will be 10:00 a.m. to 12:00 p.m. Wednesday. To send flowers or a remembrance gift to the family of Sallie Mae Gray, please visit our Tribute Store. "Email Address" would like to share the life celebration of Sallie Mae Gray. Click on the "link" to go to share a favorite memory or leave a condolence message for the family.